East Africa is industrializing at a very rapid pace; and our population needs to align with emerging opportunities. Burhani Engineers Limited (http://BurhaniEngineers.com) signed a partnership with the Kibera Sub-County government to provide computer systems and Engineering Power Classes to pupils within the county. The distribution is aimed at increasing interest in Science, Technology, Engineering and Mathematics (STEM) education and preparing the grassroots demographic for more technology-based career opportunities. The Burhani support is coming on a backdrop of a recent study by the US department of education that projects an increase in STEM jobs. The study shows that students perusing mathematics increase their chances of obtaining a job by 16 per cent, computer system analysis by 22 per cent, system software development by 32 per cent, medical scientists by 36 per cent and biomedical engineering by a whopping 62 per cent. This support is good news for the country’s digital learning programme that is set to instill computer studies into pupils from class one. Mid this year, the government embarked on its free lap top project by distributing over 12,000 learning devices to 150 public primary schools as the pilot for Digital Literacy Programme. The government intends to distribute 1.2 million devices to public primary schools across the country by next year in a programme that has since been re-branded Digi School. 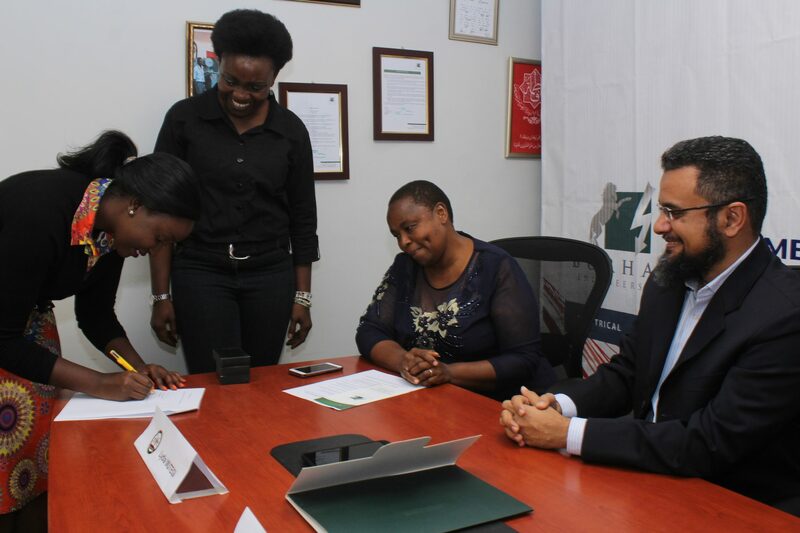 The partnership, signed between Burhani Engineers Limited represented by the Managing Director Mr. Zoher Pirbhai, Kibera sub-county Directorate of Education, represented by Mrs. Lydia Mutegi and the Kibra MP’s Office represented by Ann Ithara, will see at least 10 schools receive 10 computers in the first round. Moderated by Funke Michaels-Miano, an MIT and Harvard University Fellow, the initiative will benefit Kibra schools including Kibera Primary, Toi Primary, Mbagathi Primary, Olympic Primary, Redrose school, Kibera Secondary, Mbagathi secondary, Olympic secondary and the sub-county education directorate. “East Africa is industrializing at a very rapid pace; and our population needs to align with emerging opportunities. We need our workforce to have the necessary skills to be competitive in these highly technical areas. We see a situation whereby we can reach to the young talents, nature their talent and improve their Knowledge in ICT” Mr. Zoher Pirbhai said. He added that the Engineering Power Classes will be taught once a week in the schools by Burhani team members. Being a second generation engineer himself, Zoher explored the role of corporate citizens in imparting hands-on knowledge within the community. As champions for the next generation of engineers, and as talented colleagues in related fields, the forward-looking team at Burhani Engineers are perfect examples of #AfricaRising with many champions coming up among us. In her remarks, Mrs. Lydia Mutegi a veteran teacher herself, thanked the firm for the initiative and assured them that the computers will be put into good use.